JAMES HARDEN SCORED 34 points and the Houston Rockets withstood a furious effort from Oklahoma City star Russell Westbrook to oust the Thunder from the NBA playoffs on Tuesday. The Rockets beat the Thunder 105-99 to win their best-of-seven Western Conference first-round series four games to one. Rockets reserve Lou Williams scored 10 of his 22 points early in the fourth quarter as the Rockets responded to a sensational third quarter from Westbrook, who carried his team to a 77-72 lead going into the final period. Westbrook scored 10 straight points in one stretch and finished with 20 points, five rebounds and three assists in the third. But Williams opened the fourth with two free throws, and added three more from the line along with a three-pointer as the Rockets regained the advantage with Westbrook on the bench – and they held on even after Westbrook re-entered the game as the Thunder missed a string of shots. Westbrook finished with 47 points, 11 rebounds and nine assists, but connected on just two of his 11 shots in the final period. The defeat brought a close to a historic season for Westbrook, who joined Oscar Robertson as the only players in NBA history to average a triple-double and beat Robertson’s 55-year-old record for most triple-doubles in a regular season with 42. In withstanding Westbrook, the Rockets showed they have plenty of defensive ability to go with their free-wheeling offense. The two received double technical fouls for jawing at each other during the game, but Beverly said the Rockets did what they set out to do against Westbrook. In the second round the Rockets will face either the San Antonio Spurs or Memphis Grizzlies. The Spurs, seeded second in the West behind the Golden State Warriors, seized a 3-2 lead in their series Tuesday with a 116-103 victory in San Antonio. Kawhi Leonard scored 28 points, Patty Mills added 20 and Tony Parker chipped in 16 as the Spurs bounced back from a heartbreaking overtime loss to the Grizzlies in game four. Reserve point guard Mills made five three-pointers, four of them in the fourth quarter en route to his career-high playoff scoring total. The effort from Australia’s Mills helped thwart a Grizzlies rally. Memphis trailed by 18 with less than two minutes to play in the third quarter, but a 17-3 scoring run saw them pull within four points with nine minutes to play. “We made shots, that’s what we didn’t do the last game,” said Spurs coach Gregg Popovich, whose team will try to wrap up the series in game six on Thursday in Memphis. The Utah Jazz are also closing in on a second-round berth after a 96-92 victory over the Clippers in Los Angeles. Gordon Hayward scored 27 points and pulled down eight rebounds for the Jazz, who took a 3-2 series lead with game six in Salt Lake City on Friday. Rodney Hood scored 16 points and Joe Johnson produced nine of his 14 in the fourth quarter for Utah, who had 11 points and 11 rebounds from French big man Rudy Gobert. Chris Paul scored 28 points for the Clippers, who played their second game without standout scorer Blake Griffin, who will miss the rest of the playoffs with a right big toe injury. The winners of the series will face the Warriors, who swept the Portland Trail Blazers in four games. 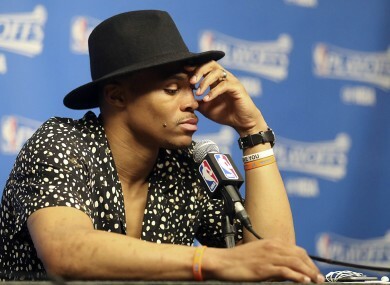 Email “James Harden and the Rockets ended Russell Westbrook's historic season last night ”. Feedback on “James Harden and the Rockets ended Russell Westbrook's historic season last night ”.